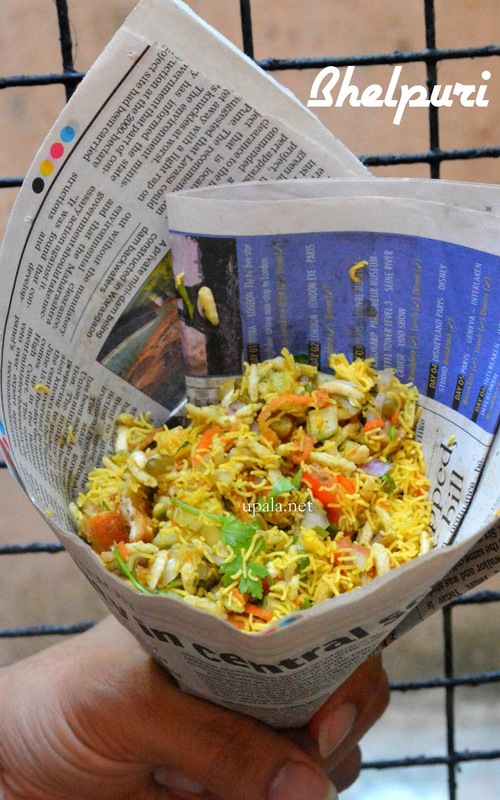 Bhel Puri is one of the popular Street food in Mumbai. This yummy chaat is a mixture of all veggies with Puffed rice and Sev. Highlight about this popular street food is that you can prepare it according to your taste...add more green chutney for a spicy version or add more Sweet chutney for a sweetish tinge. There is no hard and fast rule to prepare this bhel, all the proportions can be altered according to your taste. 1) Wash and soak the green gram overnight. Drain the water transfer it to a cotton cloth and wrap it. Small sprouts will start developing in after 6-7 hours. 2) Steam the sprouted moong dal until it turns soft but not mushy. Boil potato, after it cools remove the skin and chop it into pieces. 3) Take a mixing bowl and add all veggies (Onion, Tomato, Cucumber, Carrot, Raw mango), add Green gram and Potato. 4) Next add Green chutney, Sweet chutney and mix well. Next add Red chilli powder, Chat masala, Black salt and mix again. Break the papdis into pieces and add. Mix them well. 5) Add Puffed rice, Sev and mix well and while serving sprinkle Sev and Coriander leaves on top of Bhel. 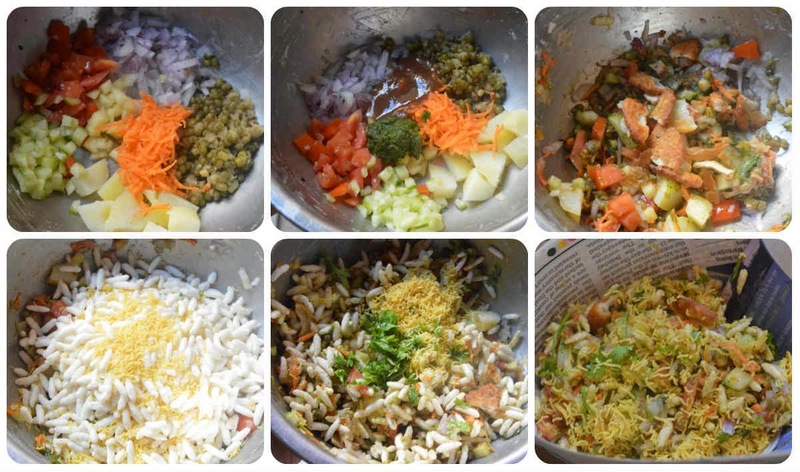 1) You have lots of variations in Bhelpuri, you can omit Green gram and potato to prepare simple one. 2) Some might prefer to add roasted peanuts too. 3) Another variation is adding pomegranate seeds.